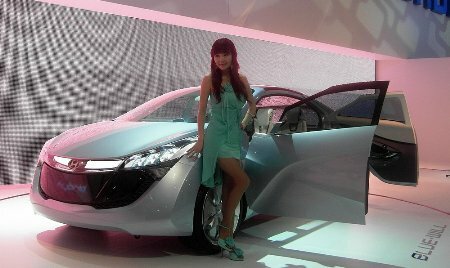 During the first day of the 2009 Seoul Auto Show, Hyundai has unveiled its latest concept car called Blue Will. The Blue Will concept is an advanced plug-in hybrid vehicle built on Hyundais in-house developed hybrid powertrain technology. The so-called Blue Drive technology mates Hyundais brand-new 1.6L GDI engine, continuously variable transmission and 100kw electric motor. The four-cylinder engine is equiped with GDI (gasoline direct injection) technology and generates 134 horsepower. The electric motor provides additional 20 horsepower which brings the total Blue Wills horsepower output to a respectable 154 horsepower. 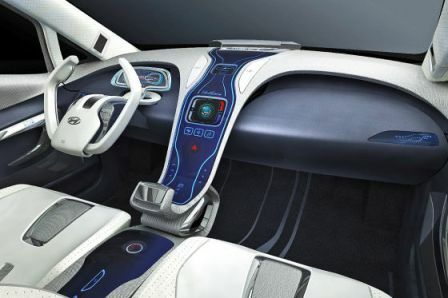 The state of the art lithium ion polymer battery, which is believed to be the first use in a car ever, is placed next to the fuel tank and below the rear seats to maximize the storage space in the trunk. Its obvious that such state of the art technology as was applied into the Blue Will concept brings some impressive fuel consumption numbers, and indeed, the Blue Will achieves fuel economy rating of over 100 miles per gallon (US MPG). According to Hyundai, Blue Wills optimal fuel economy is rated at 106 MPG (US) which places the vehicle in the group of worlds most fuel efficient vehicles. The plug-in hybrid concept, which enables to be plugged in to your home power outlets, also features a dye-sensitized solar cells on its panorama-roof, that help to charge the batteries up. Many of the body parts you see on the Hyundai Blue Will are made of recycled drink bottles, while materials used inside are made from plants extract rather than fossil fuels and are bio-degradable.